French Bulldogs are a brachycephalic breed and present an anesthetic challenge. This is not news to their devoted fanciers! Sometimes, however, it can be to their veterinarians. Their lovely plush heads give them short noses, small nostrils, narrow tracheas and thickened airways which in turn creates a different way of processing anesthesia. Unfortunately, we have all heard the horrific stories of someone's poor sweet Frenchie who died while under anesthesia. Lately, It seems, we have been hearing even more of this sort of story. This prompted me to share my personal anesthesia protocol which I use in my frenchies and my clients' frenchies. About the Author: I am a practicing small animal veterinarian in Westlake, Ohio. I have a special interest in reproduction and brachycephalic breeds. 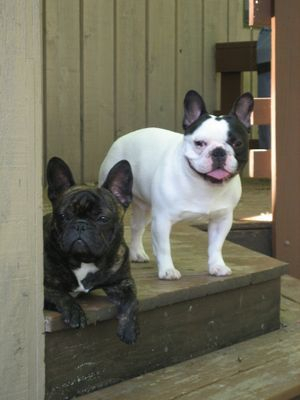 For almost 15 years, I have been a French bulldog breeder and exhibitor, veterinarian to several hundred regular frenchie patients and I consult worldwide on many French bulldog cases. This is in no way meant to be the only way to anesthetize a frenchie but I hope it will encourage owners to open a dialogue regarding anesthesia with their veterinarians and the idiosyncrasies of our breed. If your pet has had an adverse reaction to ACE or a vaccine, or for that matter any medication, please take the time to report it to the FDA . I have compiled a few surveys to help gather information related to french bulldog health and reactions to certain drugs and vaccinations. These surveys are developed exclusivley by me, and reflect no other views or interests besides mine. I do hope to detect patterns from the information that can be useful for future recommendations for frenchies as a breed. Please read below and take a minute to complete the surveys as they fit your french bulldog's history. All results will remain anonymous and used strictly to compile statitistics, if possible. The French Bulldog can benefit from your responses! THANK YOU! Has your frenchie been administered Acepromazine as either a sedative, pre-anesthetic or during recovery? Did he/she have a bad outcome? If so, please take a minute to complete the following form for each dog and/or incidence. I am trying to compile useful information for our breed. All information will be kept confidential and will only be used only to compile statistics. Please be as honest and specific as possible. Please do not include any doctors' or clinics' names. DOSAGES are extremely important. I will try to report my findings as information becomes available. Has your French Bulldog had an adverse reaction to a vaccine? If so, please take a minute to fill out the form by followin the link below. I will try to report my findings as information becomes available.